1) How can you help me? LinksManagement offers quality manual link building services and other SEO services. 2) How much do backlinks cost? Prices differ and start from $0.15 per link. To check prices for your niche, go to our backlink inventory. 3) How can I see your inventory? Sign up at our website, set your filters (DA, PA, outbound links, country, language, category (niche), keywords) and you’ll see backlink offers on your requirements. 4) What is the average time for backlink placement? The average time for a backlink to be placed is 5 days. 5) What if a link is not placed? Any guarantees? We guarantee 100% refund for a link if it was not successfully installed within 5 days on the publisher’s website for any reason and 100% refund for a link if you cancel it within 5 days after installation. No, there are no niche restrictions. 7) Do you send samples? Yes, we do, send your request in the thread or in PM. 8) Do you have FREE products? We have FREE SEO Cost Calculator, SEO Expert Tool, free SEO Reports. 9) Do you have any bonuses? We can offer $25 for backlink purchase and a welcome bonus for new users. 10) What should I do to get $25 bonus? Sign up at our website, send us your registration email and request your bonus. That's all. 11) What can I spend the bonus on? You can spend the bonus on backlink purchase. 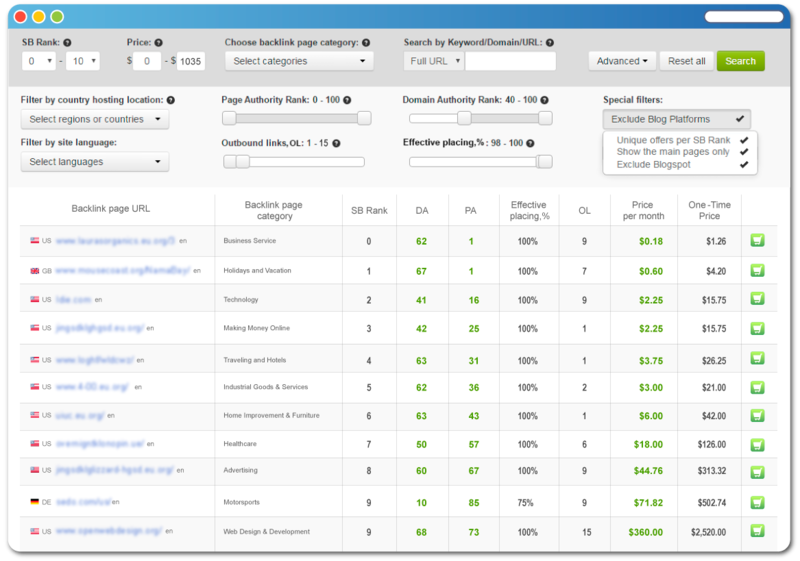 Check Backlinks In The Largest Inventory Now! Ready for new orders for Contextual Backlinks! Check Our Inventory To Find Links For Your Niche! Is there a way to test the service without adding $25? Bonus will be added if I top up my account at least with $25. We do not offer free backlinks as the prices are set by publishers and we can not change them. Yes, welcome bonus will be added if you add $25 on your account. Plus, you can request additional $10 in this thread. In this case you will have $60 for testing your account. It is a good sum for a start. Ready for new orders for Contextual Backlinks! Check Our Inventory! on your seo campaign page, i don't see any adult categories. It may happen sometimes due to the popularity of backlinks for this niche. We can offer you links in niches close to yours, e.g. Relationship niche. Just a Reminder That Everyone Have 5 More Days to Benefit from Black Friday Deal! Create a PayPal Subscription for at least $50 from 21-30 November 2018 and start getting +5% monthly bonus from your subscription sum ALL THE YEAR up to October 2019 (included)! Just a Reminder That Today is The LAST DAY to Benefit from Black Friday Deal! ALL THE YEAR up to October 2019 (included)! Lots of online resources claim that backlinks still work and remain one of the main ranking factors in the upcoming year. What should you do to get the bonus? He can you please refund i upload some money on your account but did not an feedback so far from you! Im in the 30 days refund police term. Our support team has already replied to you via email (the offered links with traffic appeared to be expensive). On your request, you will get the refund within 5 business days. You will be able to check the balance in your client panel. But to see inventory I've to pay from 1k to 10k monthly????? Only 0.0XXX% are visible if I don't pay from 1k to 10k monthly?? No, it's not like sape, the inventory is our own. As for the hidden inventory, unfortunately we can't reveal some websites due to the signed up NDA with publishers. But we can help you with getting links from such websites. If you want to see some examples for a definite niche just send it and we'll select a few samples for you to review. We offer different packages for our clients. The budget depends on your needs actually. Even if you have a tight budget you will find enough backlink offers for your niche. Take Your Chance to Save Your SEO Budget! Buy any backlinks till January 01, 2019 and get 10%, 25% or 50% bonus in 2019! I've know this service for like 3 years but always confused on how to use it. Just visit https://www.linksmanagement.com/ and use the chat at the bottom on the page.